[CONFSERVER-23184] Setup hangs loading users from JIRA - Create and track feature requests for Atlassian products. We have created a local administrator with the same username and password as the JIRA system administrator you provided. This will ensure that you can always log into Confluence to update the system configuration." The next button is visible but cannot be clicked. If I refresh the page I get one of the following next to the spinning circle (in no particular order): "Synchronisation completed successfully. ", "Synchronisation started. ", and "embedded.crowd.directory.caching.sync.full"
"Confluence - localhost - c2f77bbd-57fe-3852-bda6-8bfc6c0cdca9"
The only IP address on that is the real IP address, it doesn't have the local addresses. I tried adding these and restarting confluence (from init.d) but it didn't help. 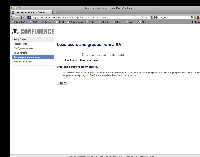 I have confirmed this is not a problem with Confluence 3.5 (though this is post-setup in that version). I have tried recreating the confluence database and deleting the application data - this allows me to run through setup again but it hangs at the same place. The Next button will be enabled for the next page.